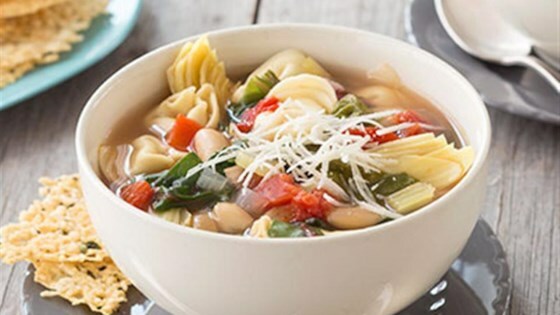 "Perfect for cold-weather entertaining--make this soup ahead of time, freeze, and simply reheat when your guests have arrived." Line a 5- to 6-quart slow cooker with a Reynolds(R) Slow Cooker Liner; set aside. Add the roasted peppers, broth, beans, tomatoes, artichoke hearts, celery, onions, olive oil, and garlic to the lined-slow cooker. Stir gently with a wooden spoon or rubber scrapper to combine. Stir in Swiss chard and tortellini gently with a rubber spatula and cook 7 to 9 minutes more or until pasta is just al dente. Serve with Parmesan cheese and Parmesan Crisps, if desired. Parmesan Crisps: Preheat oven to 375 degrees F. Line two large baking sheets with Reynolds(R) Parchment Paper. In a small bowl, combine Parmesan cheese, fresh thyme or rosemary, and black pepper. Spoon the cheese mixture into 12 portions, 4 inches apart onto prepared baking sheets. Pat each cheese portion into a 5-inch circle. Bake 4 to 6 minutes or until bubbly and golden brown. Let stand on baking sheet until completely cooled. Carefully remove crisps from parchment paper. There's nothing quite like a delicious bowl of hot soup to warm your heart! And you can prepare this dish ahead of time and freeze using freezer-safe containers. Before you serve, thaw overnight in the refrigerator, then line a 6-quart slower cooker with a liner, and add the finishing touches and enjoy. Once tummies are full and the soup is finished, just throw away the liner for easy cleanup! This was fantastic. My store did not have swiss chard so I used fresh baby spinach in place of this and it was great. The little parmesan crisps were a nice added touch! I made it following the recipe except used spinach instead of kale. It was a big hit. I will definitely make it again! Used half as much roasted red pepper and chard. Great fall soup! Awesome soup. Easy to make and heart.